Do you have Pins? some Yarn? a pillow? As I was sitting and finishing up some holiday crafting my son Max couldn't keep his hands off of my pin cushion. He kept taking pins off of the magnetic holder and dropping them on the floor. No good with a baby around. So I grabbed a pillow from the couch and turned it over and told him that he could press the pins into it. It started with him just randomly pushing them into the pillow. Then he started lining them up and called it a train. And then he said they were flowers in a garden. I love adding a little fuel to his fire so I asked him if he needed some water to help his flowers grow. I gave him a piece of yarn and told him it was his hose. He "watered" the pins and as he did I slowly raised each pin like they were growing. He was tickled with this little game. We watered and grew and then pushed down and watered some more. 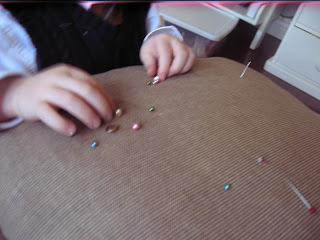 As we played this little garden game I thought about using the pins as pegs on a geoboard. Do you remember geoboards in school? I did a spin on it and placed the pins in a certain shape and had him follow the pins, wrapping around each one as we went along. (knot the first one around the first pin) You can see the house in the first picture. We did a few shapes and a few letters together before it was time to clean up and do who knows what. I love impromptu diversion. Let them lead. You just bring the fuel. COST: Ummm..... please tell me you have straight pins! and yarn or string! and a pillow? Variation: use different color yarns and create different artwork. Take pictures before disassembling. 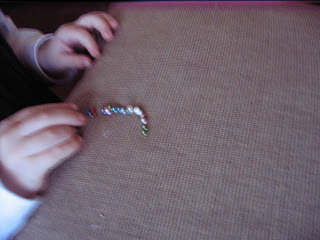 For older kids, have them try to place the pins to create pictures like a dot to dot. if you have multiple color pins, they could have to connect them in an order, like rainbow order or something. That way they could create something and a friend or you could complete it. I just had a great idea - what about turning over couch cushions and really getting crazy? You would have to definitely explain that pins don't go into anything, but if you had a canvas-y type couch or the undersides weren't something you would ever use, you could create some real masterpieces. I could see older kids trying to line up the pins in a way to spell their names in cursive using the yarn..... or creating a grid and putting objects into the grid. Make a zoo grid, a jail grid, a collection grid, a snack grid. Okay, I just love lateral thinking. I'll stop now. Oooh, I really like this! 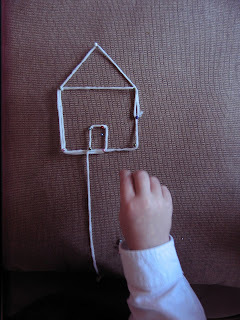 My kids are always getting into my pins and designing things with them but using the string too - well, that's just brilliant!! cassi bella dia cassi? am I going to get more traffic soon? just found your blog. . .adorable. . .
love your picture over on the side. i have that same pic on my website. 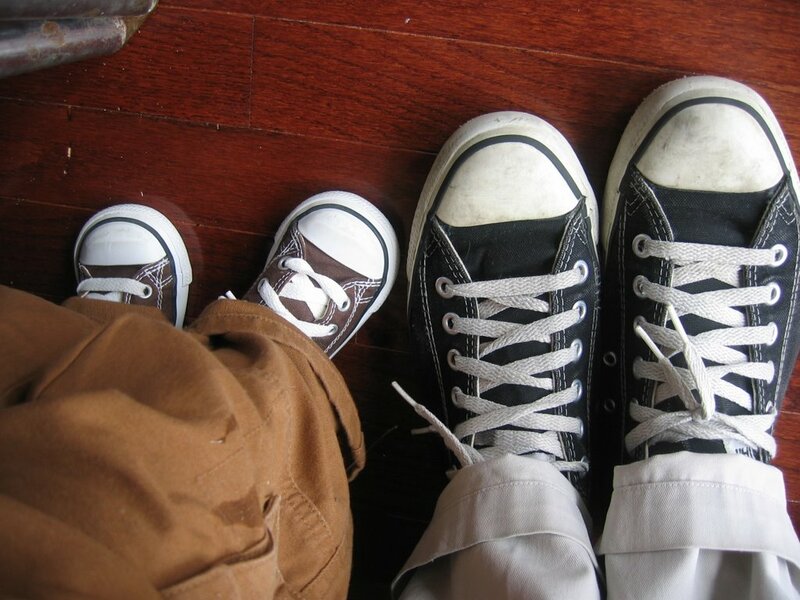 it was taken so long ago, that it just doesn't "fit" on there, but i can't seem to remove it. . .it's me and my oldest little guy! This is a wonderful idea - we have been sewing in my classroom and the fascination with the pincushion really surprised me. This makes it purposeful. Thanks! This is a great idea - my son is going to love it, since he knows pins are a grown up thing to use.